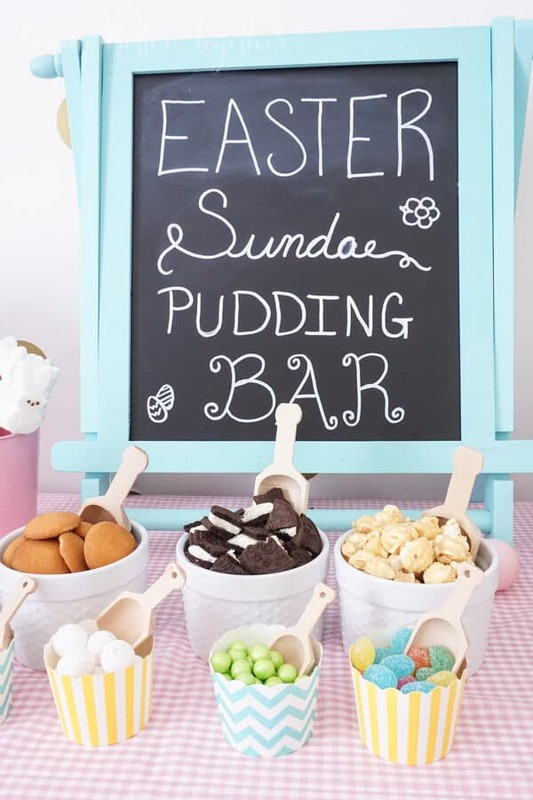 This Easter Sundae Pudding Bar with Snack Pack is the perfect way to celebrate with family! Such an easy and fun way to welcome spring! It’s finally spring! Who’s excited? I know I am, we’ve had over 130 inches of snow this winter and it’s been exhausting. I’m excited to see it melt and watch the flowers bloom, though they probably won’t be my flowers because I have a terribly black thumb. 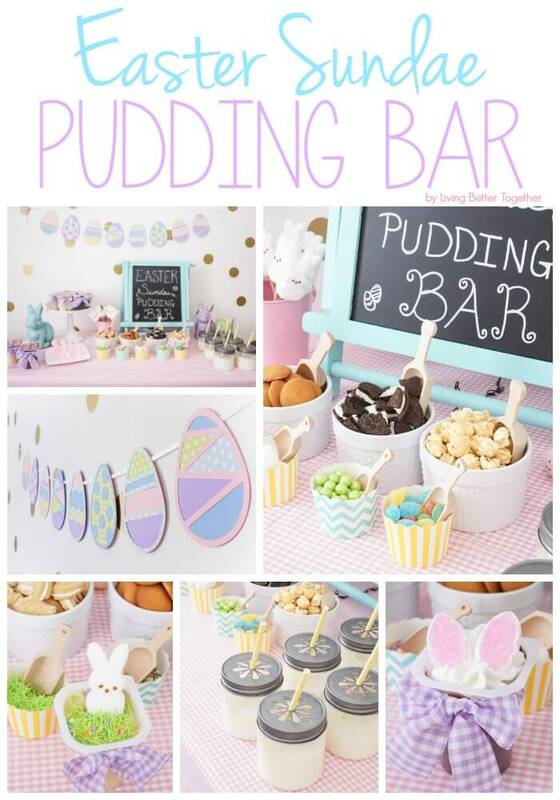 With spring comes Easter and new beginnings, pastels and bunnies and sweet treats! We have a tradition in the Hubbell house, Easter Sundaes on Easter Sunday. This year, my in laws will be out of town for Easter, so we’ll miss out on our tradition, but that doesn’t mean I can’t share it with you guys! Since it’s still absolutely freezing up here in the Northwoods of Maine, I figured I’d mix it up a bit! After all, you don’t need ice cream to make sundaes! 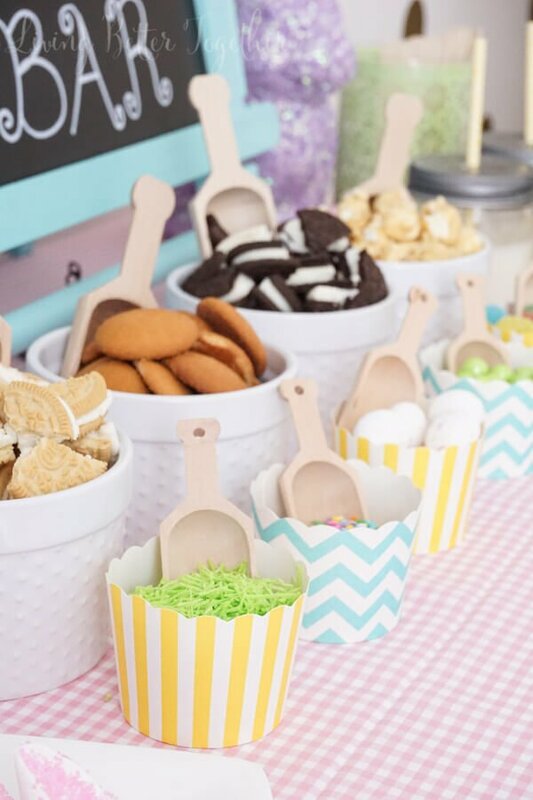 I picked up some vanilla and chocolate SUPER Snack Packs and all the fun toppings for the sundae bar at Walmart. Right now you can save $.50 cents off of one SUPER Snack Pack 6 pack. Print the coupon here. Of course, I had to decorate too! I knew I wanted to keep it simple, something that anyone could easily pull off. I stuck to fun pastels and a simple set up. I mixed up the patterns to keep it exciting and break the presentation up, and NEVER under estimate the power of some solid pieces in a tablescape! I kinda fell in love with all the spring colored gingham at the fabric store and thought it would be absolutely perfect for the party! 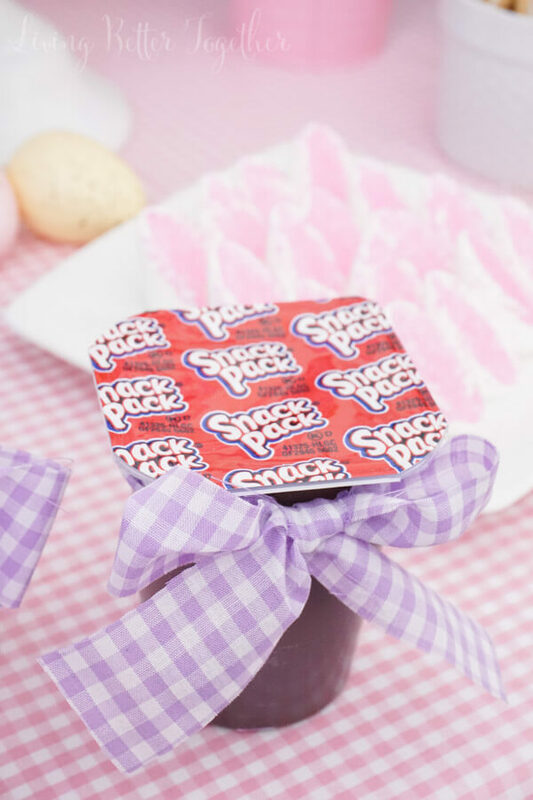 I cut some of the purple into 12 x 1 inch strips and tied it in a bow around the Snack Packs to make them a little more festive. 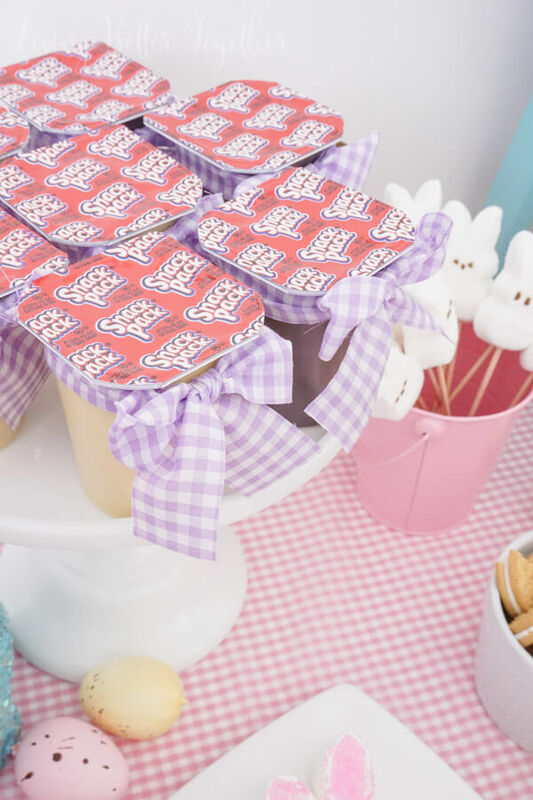 The adorable drink containers and scoops are from Pink Lemonade Party on Etsy. 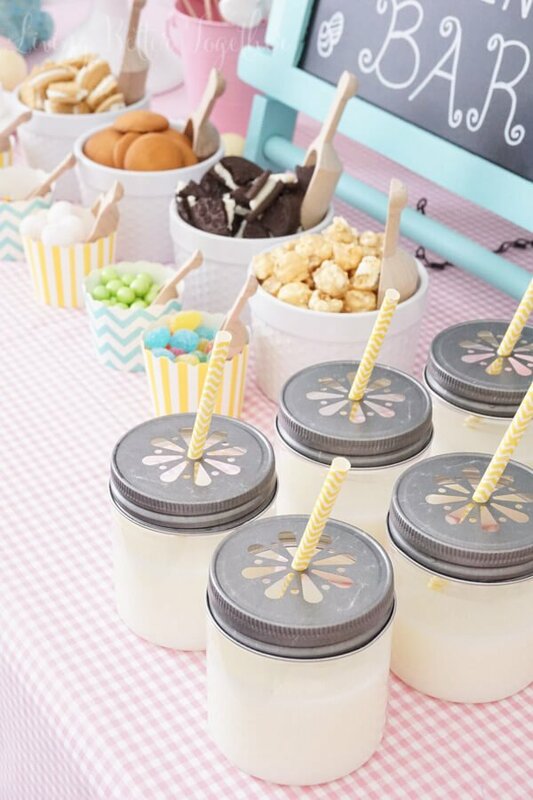 Some paper straws, ramekins, cupcakes liners, and wooden spoons were the little things that brought it all together. I wanted to have a nice variety of toppings so everyone could personalize their Snack Packs. 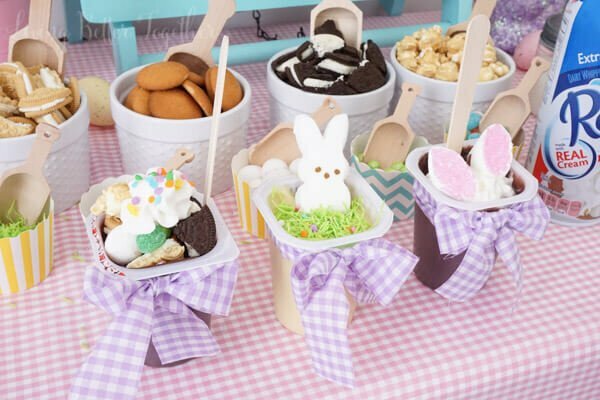 I had OREOS, Nilla Wafers, Crunch n’ Munch, Reddi Whip, candy shred, marshmallow bunny ears (aren’t they adorable, see the step by step below), sprinkles, Sixlets, Peeps, and gummy jelly beans. There was a little something for everyone. 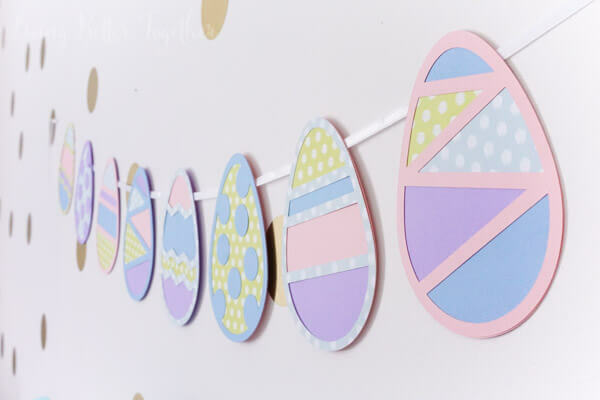 My good friend Cori over at Hey, Let’s Make Stuff made this adorable egg banner for me. You can actually get the cut file for your silhouette or cricut here. 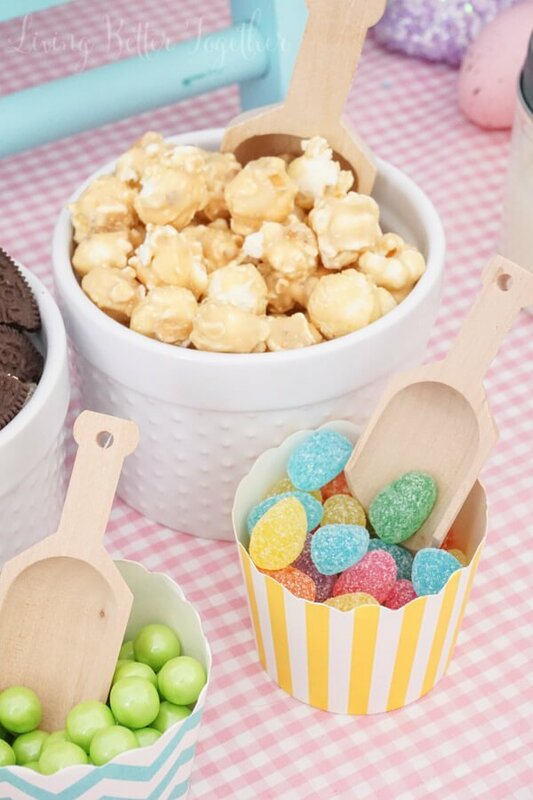 It added the perfect touch to the party and helped bring all the fun colors together! I really love how everything came together, it was just the thing to brighten up a chilly Sunday afternoon. What would you add to your Pudding Bar for fun toppings? 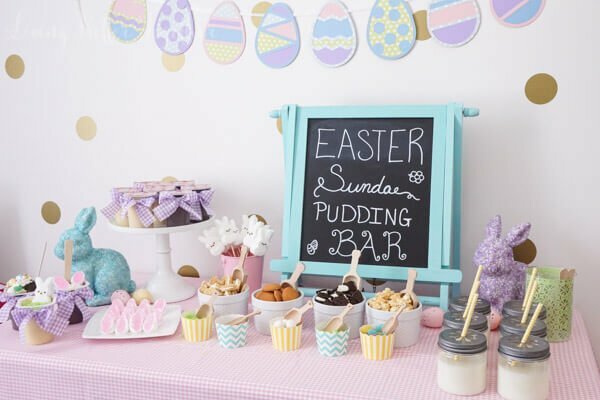 I’d love to hear how you celebrate Easter and what fun traditions and treats your family shares! 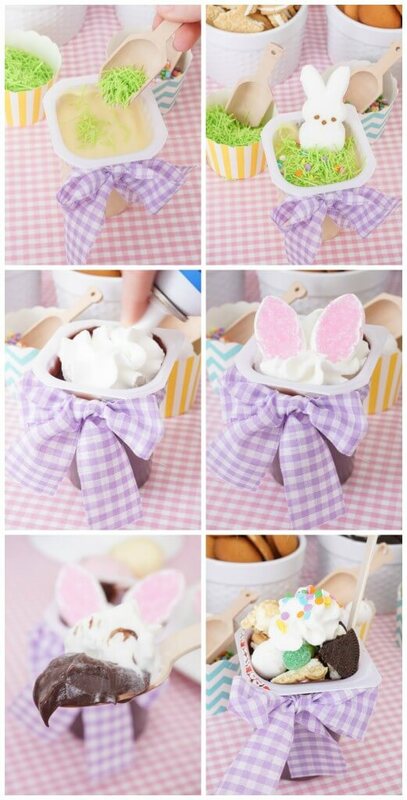 As promised, here’s a quick step by step photo on how to make those adorable marshmallow bunny ears to top your Snack Pack sundaes or other Easter desserts with! 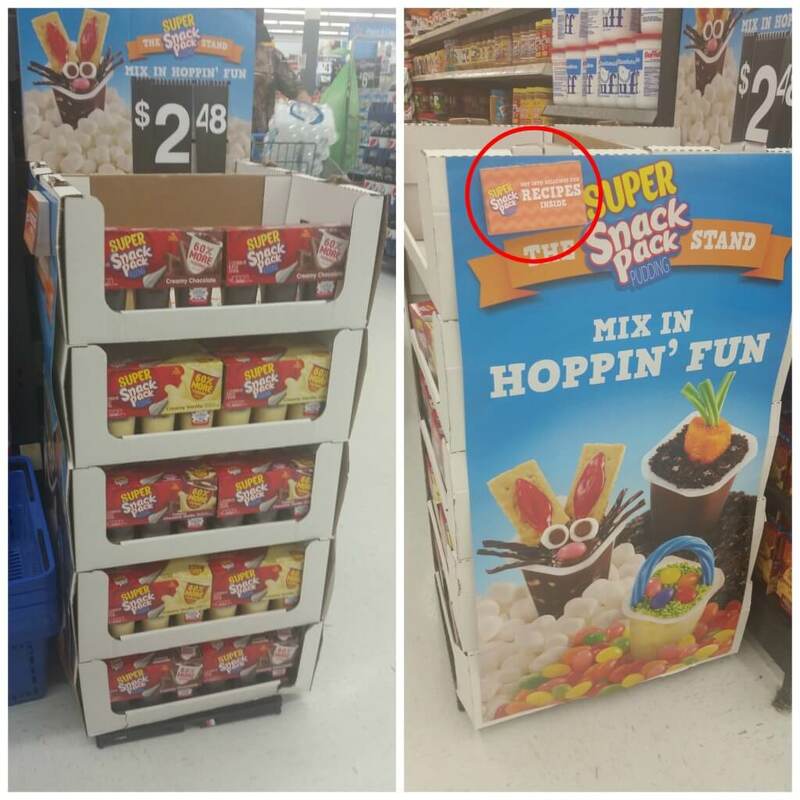 Be on the lookout for a Special Display featuring the SUPER Snack Packs and mixin ideas for Easter at your local Walmart! There will be a recipe tear pad on the display with more great ideas to get you inspired!